As Senior Consultant: Treasury Management, you are mainly responsible for drawing up business cases, selecting new treasury systems, bank rationalization, organizational set ups. Zanders UK and CH have established itself as a recognized specialist in treasury management. We are recruiting for a Senior Consultant who has the ambition to further grow in corporate treasury solutions but also contribute to the development and recognition of Zanders. 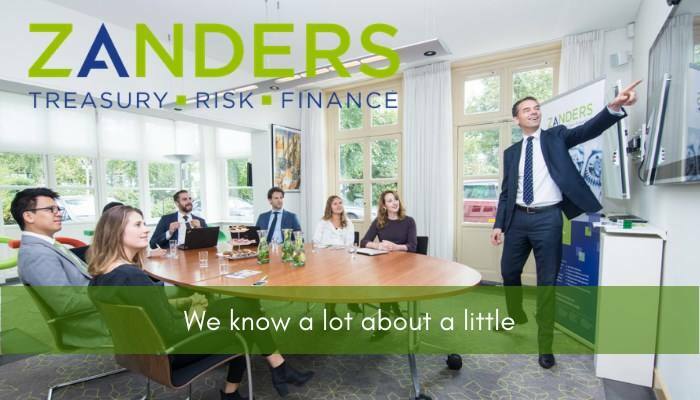 Zanders employs over 150 people who operate from our offices in The Netherlands, Belgium, United Kingdom, United States and Switzerland. Zanders encourages its employees to share their ideas and to remain at the forefront of innovative services and solutions. We offer the possibility to specialize and develop professionally, taking on personal responsibility for client projects from an early stage. Our culture is transparent and thrives on the open exchange of ideas and knowledge between colleagues. Please send your application for Senior Consultant: Treasury Management at Zanders in Londen or Zürich including your CV via our website.